“Reading Nation … Leading Nation” was the slogan of the event “Kitab Mushaera” i.e the book poetry session arranged by Literary Committee of Pakistan Association Dubai in which Pakistani scholars, poets, authors & other community members unanimously paid tribute to His Highness Sheikh Khalifa bin Zayed Al Nahyan (President of UAE) & U.A.E government for initiative to celebrate “2016 as Year of Reading” . Mr. Abdul Wahid Khan the Press Counselor of Pakistan Consulate in Dubai was the chief Guest of the event. A unique part of the evening was the “Expressing solidarity with the book” in which all scholars, poets, Authors, Doctors, educationalists & other community members collectively showcased their sentiments for book culture & reading habit. All participants took books in their hands & showed determination for their commitment with book & reading habit. Representing Literary Committee Mr. Tariq Rehman welcomed the academic & literary circles of U.A.E. Analyzing the Reading state of Pakistani nation he mentioned Gallop Pakistan Survey that shows only 39% of the nation and literate people have the reading culture. It reflects the root causes of many social issues . Mr Zahid Hasan, Mr Fahim Memon , Mr Tabish Zayedi & Dr Ameera Shah presented their work on their favorite books . In his presidential speech prominent scholar & poet Dr Sabahat Asim Wasti thanked the U.A.E rulers & people for their efforts to improve reading habit among the masses residing in U.A.E. it reflects the zeal & passion of U.A.E nation towards knowledge, wisdom & education. He expressed his feeling by saying that Pakistani scholars & community is proud to be part of this campaign. Chief Guest Mr. Abdul Wahid Khan the Press Consular of Pakistan Consulate thanked the U.A.E government for focusing on a need of time. 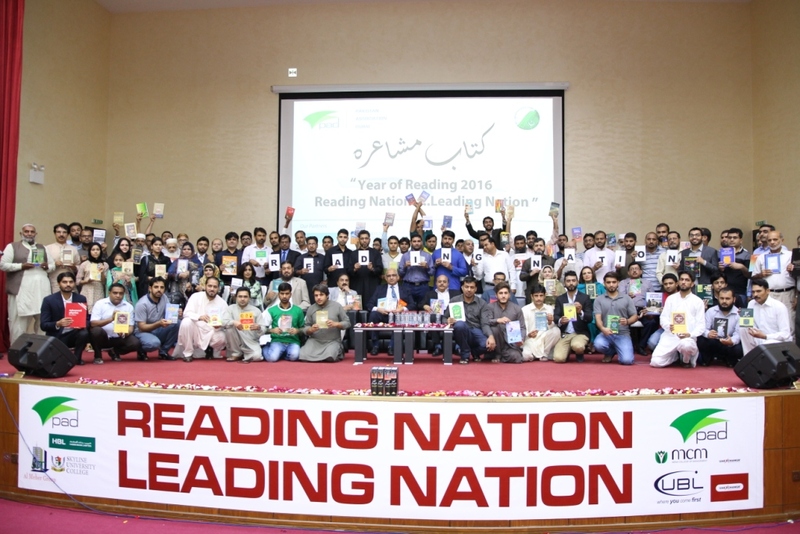 He also encouraged the PAD literary Committee to showcase concerns of Pakistani community to improve reading habit. Referring the slogan “Reading Nation … Leading Nation” he gave examples of nation who are on the path of success by improving reading trend in their societies. Mr. Tahir Zaidi the Joint Secretary of Pakistan Association Dubai thanked the guests of the evening. He presented the Independence Day Celebration Program in detailed which include Pakistani Desi Games Night, Medical Camp, Azadi Show on 14th August .Today’s grand Mushaira is also part of the celebrations in which Dr Sabahat Asim Wasti , Syyed Sarfraz Hussaini , Maqsood Tabassum , Farooq Darwesh , Farhad Jibrail , Asif Rasheed Asjad ,Hafiz Amir,Shireen Presham , Tabish Zayedi , Musarrat Abbas, Nadeem Zeest, ur Rehman, Saeed ur Rehman , Tariq Hussain & other recited their poetry . Mr Tariq Rehman & Mr Tabish Zayedi hosted the evening.